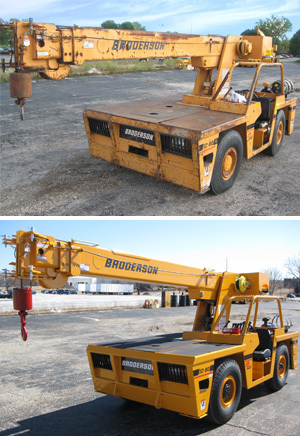 Broderson offers factory-certified carry deck cranes, refurbishment options and services. When it makes more economic sense to rebuild rather than replace, Broderson is dedicated to remanufacturing your carry deck crane to the same high standards of a new Broderson crane. Remanufacturing begins with an extensive multipoint structural, wear and safety inspection. Our trained factory technicians break down each remanufactured crane and inspect every component and system. Cranes are refreshed from top to bottom, and extensively tested to ensure your crane meets the Gold Standard. And you get the peace of mind that comes from knowing that your Broderson-refurbished crane comes with a 6-month warranty. It's everything you’ve come to expect from Broderson, the industry's most trusted provider of remanufactured carry deck cranes.